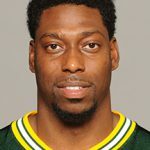 Free Agent Tight End Jared Cook is to join the Raiders from the Green Bay Packers. A former third round pick in 2009 out of Carolina, Cook played for the Titans and the Rams before joining the Packers. Now as a Raider, Jared Cook will provide Derek Carr with a huge target on offense to compliment a powerful set of wide receivers. In the 2016 season Jared Cook played 10 games, making 30 receptions for 377 yards during the regular season. However, when it mattered post-season, Cook came up with another 18 receptions and two touchdowns, including an incredible sideline catch to set them up for the win against the no.1 seed Cowboys. Standing at 6-5 and weighing 254 pounds, Cook is a formidable weapon for Carr. In his day the TE could run the 40yds in 4.45, so he is sure to stretch the field. No team can afford to just put a corner on him and expect not to be thrown over. The opposition will need a safety and/or linebacker to help out. Derek Carr should be thanked for the signing as much as GM Reggie McKenzie, after it was reported he lobbied for the playmaking tight end hard. Cooks contract is for 2-years $12.2million with the first year being fully guaranteed.